This machine fit for skin packing,calendars are prepared from PVC and various of blister which formed by vacuum. 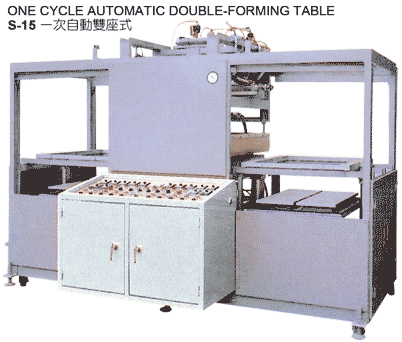 It's one cycle automatic double-forming table. When a cycle of skin packing/vacuum forming is finished,taking out the product manually. The forming of printed products also use these machine which is ordered. It use one machine heater power consumption, but have heater two sets of machine out put capacity when use this machine will have lower power consumption cost. PVC, HIPS, PS, OPS, ABS, APET, GPET, PP, PE...... etc sheet.